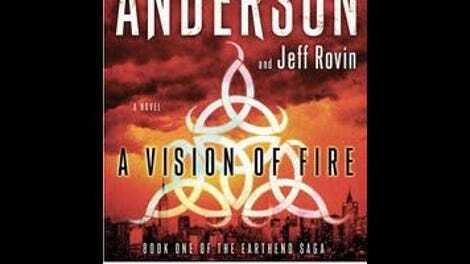 The heroine of Gillian Anderson and Jeff Rovin’s novel, A Vision Of Fire, is a rational woman thrown into a supernatural mystery. She isn’t Dana Scully, Anderson’s iconic character from The X-Files, but she might as well be; child psychologist Caitlin O’Hara’s arc throughout the novel parallels Scully’s in most X-Files episodes. Caitlin is scientifically minded, so when she’s faced with the paranormal she searches for a logical explanation. The more she investigates, the more her skepticism gives way to a hesitant acceptance of the fantastic events around her. From there, the plot approaches something closer to The Da Vinci Code, though A Vision Of Fire lacks that book’s page-turner factor. Amid a backdrop of deteriorating India-Pakistan relations, an assassination attempt is made on the ambassador of India. He survives, but his daughter, Maanik, goes into a trance-like state and speaks in tongues. Another young woman in Haiti experiences something similar, and a student in Iran sets himself on fire. Seeking to understand and treat Maanik’s condition, Caitlin embarks on an adventure involving an ancient Antarctic civilization, a MacGuffin cube that can melt brains, séances and hypnotism, Voodoo magic, and a “transpersonal plane” where souls from departed bodies hang out until they can get themselves into a new human vessel. The transpersonal plane comes courtesy of a wise old man in Iran who teaches Caitlin about universal chi energy. This orientalism provides a convenient deus ex machina for Caitlin, who can unite her Western rationality with other mystical cultures into a solution to her problem. Helping her along the way and serving as requisite love interest is boring Ben, a U.N. translator for the Indian ambassador and a convenient well of knowledge. Between these two, each question can be answered with a combination of linguistics and psychology. Unlike the gripping “just kiss already” tension between Mulder and Scully, there’s no real investment in these longtime-friends-turned-lovers. The romantic subplot seems like an inserted afterthought, and each awkward scene exploring their feelings for each other detracts from the main story. The novel’s many developments aren’t solved, exactly, and the reader gets the sense that Caitlin’s troubles are just beginning, though she sorts through enough of the mystery to land at a brief resting place. As this is being touted as “book one of the Earthend saga,” Caitlin and Ben will return for more adventures in the future. Readers can only hope they, along with Anderson, learn enough from this first trial to improve on the next one.